We made this men's compression top for maximum support and breathability. The resilient compression fabric fits snugly for easing muscle stiffness. The stretchy construction and batwing pattern on the back ensure full mobility and create a comfortable fit. Speedwick technology works to keep you cool and dry while the full mesh back maximises ventilation and breathability. Plus the antimicrobial finish adds an additional layer of protection against harmful bacteria found on and around equipment. 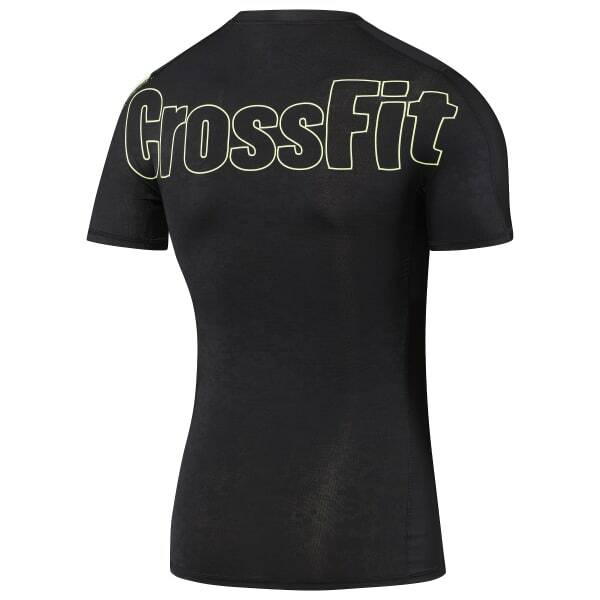 The CrossFit graphics on this T-shirt rep your loyalty to the CrossFit community and show your support for the 2017 CrossFit Games. A subtle camo detail on the mesh back panel enhances the WOD worthy vibe.